This set of Cyber Security Puzzles focuses on “Different Ciphers and their Security Strength”. 1. ____________ is a mono-alphabetic encryption code wherein each & every letter of plain-text is replaced by another letter in creating the cipher-text. Explanation: Caesar Cipher is the simplest type of substitution cipher with a mono-alphabetic encryption code wherein each letter of plain-text is replaced by another letter in creating the cipher-text. 2. _____________ is the concept that tells us about the replacement of every alphabet by another alphabet and the entire series gets ‘shifted’ by some fixed quantity. Explanation: Shift Cipher is the concept that tells us about the replacement of every alphabet by another alphabet and the entire series gets ‘shifted’ by some fixed quantity (which is the key) between 0 and 25. 3. ________________ is a cipher formed out of substitution where for a given key-value the cipher alphabet for every plain text remains fixed all through the encryption procedure. Explanation: Monoalphabetic cipher is a cipher formed out of substitution where for a given key-value the cipher alphabet for every plain text remains fixed all through the encryption procedure. 4. In Playfair cipher, at first, a key table is produced. That key table is a 5 by 5 grid of alphabets which operates as the key to encrypt the plaintext. Explanation: In Playfair cipher, at first, a key table is produced. That key table is a 5 by 5 grid of alphabets which operates as the key to encrypt the plaintext. All the twenty-five alphabets have to be unique and letter J gets omitted. 5. ______________ employs a text string as a key that is implemented to do a series of shifts on the plain-text. Explanation: Vigenere Cipher employs a text string as a key that is implemented to do a series of shifts on the plain-text. Here the sender & the receiver settle on a single key. 6. The ________________ has piece of the keyword that has the same length as that of the plaintext. Explanation: The one-time pad has a piece of the keyword that has the same length as that of the plaintext. The keyword gets a randomly produced string of alphabets. For only once, its keyword is used. 7. In _____________ a sequence of actions is carried out on this block after a block of plain-text bits is chosen for generating a block of cipher-text bits. Explanation: In block cipher, a sequence of actions is carried out on this block after a block of plain-text bits is chosen for generating a block of cipher-text bits. Blocks in these have fixed number of bits. 8. In _______________ the plain-text is processed 1-bit at a time & a series of actions is carried out on it for generating one bit of cipher-text. Explanation: In stream ciphers, the plain-text is processed 1-bit at a time & a series of actions is carried out on it for generating one bit of cipher-text. Explanation: For a block cipher, a chain of actions is performed on this block after a block of plain-text. In block ciphers procedure to add bits to the last block is termed as padding. 10. Which of the following is not an example of a block cipher? Explanation: In a block cipher, a sequence of actions is carried out on this block after a block of plain-text bits is chosen for generating a block of cipher-text bits. Examples of block ciphers are DES, IDEA, Twofish etc. 11. Data Encryption Standard is implemented using the Feistel Cipher which employs 16 round of Feistel structure. Explanation: Data Encryption Standard is a block cipher which implements the Feistel Cipher which employs 16 round of Feistel structure. The block size it uses is 64-bit. Explanation: DES which is abbreviated as Data Encryption Standard falls under the category of a block cipher that implements the Feistel Cipher which employs 16 round of Feistel structure. 13. ____________ carries out all its calculations on bytes rather than using bits and is at least 6-times faster than 3-DES. Explanation: Advanced Encryption Standard is a comparatively innovative block cipher that carries out all its calculations on bytes rather than using bits and is at least 6-times faster than 3-DES. Explanation: AES is abbreviated as Advanced Encryption Standard which is a moderately innovative block cipher which carries out all its calculations on bytes rather than using bits and is at least six times faster than 3-DES. 15. AES is at least 6-times faster than 3-DES. Explanation: AES is a relatively innovative type of block cipher on bytes rather than using bits. It is one of the most popular forms of a block cipher and helps in securing various applications and systems. 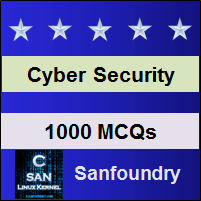 To practice all Puzzles on Cyber Security, here is complete set of 1000+ Multiple Choice Questions and Answers.